The application deadline for the cycle has now passed, and applications are closed. The application will reopen at the start of the next academic year - September 2019. The University of Plymouth is committed to helping students to develop personally and enhance their skills through a wide range of extra-curricular experiences. The trust was set up by her children following her death in 1964 and has been used to support the higher education aspirations of Plymouth citizens ever since. The current trustees are pleased to be working in partnership with the University of Plymouth and wish to encourage and support students wanting to work as professionals within the early years. Nancy Langhorne Astor entered politics in 1919 and was the first woman to sit as a Member of Parliament in the House of Commons serving as MP for Plymouth Sutton until her retirement from politics in 1945. In 1939 her husband Waldorf was elected Lord Mayor of Plymouth and supported by Nancy they served the city for five years during the second world war. During Nancy’s parliamentary career she gained attention as someone who championed temperance, women's rights and benefits for children. Nancy supported the development of nursery schools for London's poor children, a project organised by Margaret McMillan. In addition to her usual philanthropic fundraising, she led ministerial delegations for the Nursery School Association, made speeches in parliament and in 1934 published a memorandum calling for the universal provision of nursery schools. At the heart of her ‘women’s’ politics was a concern with poor households, a subject on which she was far more radical than most in her party at the time. She was passionate about housing and with Waldorf’s capital, built model homes for the poor of Plymouth (Mount Gould). She was also preoccupied with the education of the poor, sharing the McMillan sisters’ vision of nursery schools as a route out of ill-health and poverty. As well as founding some nurseries, she helped the McMillan sisters to establish a training college for nursery school teachers. 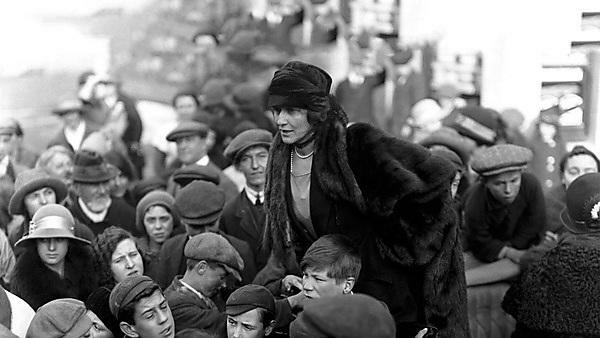 On 28 November 1919 Nancy Astor was elected as MP for Plymouth Sutton. This film gives an insight into her interests and achievements and includes first-hand accounts from those who knew her. Should you have any questions about applying for the Nancy Langhorne Astor scholarships trust bursary, please contact nancyastorscholarship@plymouth.ac.uk. Be studying within the Plymouth Institute of Education. Be under the age of 25 years on the date of their application. Travel and other expenses deemed part of a student’s programme requirements are not eligible for a bursary. 1. There are certain eligibility criteria for receiving a bursary. Before completing your application, you should check your eligibility (see the section on the left hand side). 2. Your application must be supported by a reference from your Personal Tutor indicating how long they have known you and containing a brief statement of support for your application. 3. As soon as you decide to apply for a bursary you should approach your Personal Tutor and ask them to send the reference to nancyastorscholarship@plymouth.ac.uk. 4. Applications not completed on the application form downloaded from the Nancy Langhorne Astor Scholarship page of the University website will not be accepted. 5. Complete all the fields on the application form as fully as possible and ensure that all typed words in the open comment boxes are visible. 6. Submit your completed application form to nancyastorscholarship@plymouth.ac.uk by Tuesday 13 November 2018 at 17:00. Applications received after the deadline will not be considered. 7. Application forms will be reviewed by a selection panel (the Trustees and/or their representatives) and applicants will usually be informed of the outcome of their applications by email before the Christmas break. 8. A one-off payment of up to £750 will be awarded to successful applicants towards costs associated with the activity being considered. In exceptional circumstances the amount of the award may be increased subject to the discretion of the trustees. 9. The sum awarded will usually be credited to a bank account held in the name of the applicant within six weeks of being notified of a successful application.